As a young boy living in the desert town of Wendover, Utah, my activities somewhat indicated the direction I would take as far as sports goes. My mother said when I was a toddler they had to put a harness on me because I was so fast and quick they couldn’t keep up with me. One time I ran away and was found sitting underneath a boxcar right on the track. The train was whistling to start the engine moving. Fortunately I was retrieved just in time. When I was in elementary school my best friend, Verl Jensen, liked to match me up with anyone for a foot race. I would always win and he would get the biggest kick out it. At Wendover Jr. High, our principle sent me to participate in the Tooele County Track and Field Day that was located at Tooele High School. They lined up all of us from 6th to 9th grade to see who was the fastest for 50 yards. As a young kid from a little desert town I was so scared. When they shot the gun to start the race I ran as fast as I could. I believe I won the race by 10 yards. At the finish line was a very large man by the name of Sterling Harris. He was the football coach for Tooele High School. He grabbed me by the arm and asked where I was from. He didn’t like me beating his future star football players. At Grantsville High School I played football, basketball and track. I caught the attention of many university football coaches when I scored five touchdowns in a half against Murray High School, which was five times bigger than we were. My cousin, Doug Anderson, encouraged me to try out for track. He was the only one participating. We had no track coach, no track and no equipment. I borrowed a pair of track shoes and started on my way. We had no starting blocks so we dug holes in the track so we could get a good start. In the spring of my senior year at Grantsville High School I participated in the State High School Track and Field Meet at the University of Utah. In one of the preliminary trials I had run 9.7 in the 100-yard dash. Many thought I had a chance to break the state record. But luck was not with me. I remember standing at the starting line with the wind blowing in my face mixed with rain and snow. I ran 10 flat with no record. Because I had good success in the three major sports, a friend of mine that was an NFL football player encouraged me to go to Southern California University and play for them. I chose Brigham Young University and was happy that I did. My senior year at BYU I was a Basketball All Conference guard. We won the conference title and went to the NCAA regional playoffs. We lost our first game but the format was that we played a second game with another first round loser. In that game I scored 27 points and set a regional scoring record. After the game was over a large man came over and introduced himself to me as a coach with the Los Angeles Rams NFL football team. His name was Tommy Protho. We talked a little about my speed and ability. He asked me a few questions about my future, and I told him my plans were to go on a mission for The Church of Jesus Christ of Latter-day Saints. He left without saying much more. In the spring of my senior year at BYU I qualified to participate in the NCAA Track and Field Meet in California. In one of our Conference track meets, I posted a 9.55 in the 100-yard dash. Prior to the NCAA meet in California I spent two weeks in Fallon, Nevada, with my older brother. While I was there I was supposed to do some training for the up coming meet. But being young I did very little training. 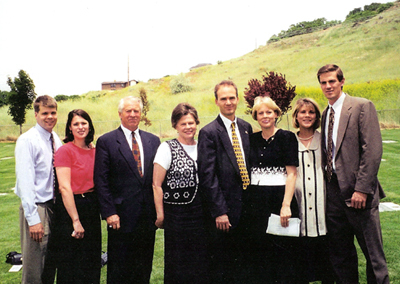 After my college schooling was over, I served a mission for The Church of Jesus Christ of Latter-day Saints in England. While serving a mission I gained knowledge of “The Plan of Salvation” that the Book of Mormon so beautifully explains. I read an article that stated that many are not sure of the Resurrection and that they don’t know where they will go after death. Sometimes I just wish I could explain the Plan to everyone. It is one of the most beautiful doctrines the Lord has given to mankind. I also wanted to mention one other thing that seems to be a growing trend in our society. I was always taught the no one should use the Lord’s name in vain. You have all heard it when some one will say “Oh my—-.” I don’t and will never profane my Father in Heaven’s holy name. The picture above is a picture of my family, my wife, two sons, a daughter and their spouses. This picture was taken at a cemetery that is the burial place of our granddaughter. We are so grateful for the knowledge that teaches us that if we live the principles of the gospel of Jesus Christ and do certain temple ordinances, we will be a family forever. What a blessing that is. Coach Harold Anderson is a husband, father of three and grandfather of 23. He was a high school and collegiate player in football, basketball and track. He coached high school basketball teams in two state championships games (lost both by 1 point each). He was an assistant basketball coach at Brigham Young University. While an assistant coach at BYU, the BYU basketball team went to the Final 16 in the NCAA. Coach Anderson has served in many LDS Church positions, including three missions, bishop, and in a stake presidency.